Sarawak "the land of the hornbills"
You can spot the hornbill everywhere in Malaysia, if you try, good places to spot hornbills elsewhere in Malaysia are Taman Negara, Fraser's Hill, Langkawi, Gunung Mulu National Park, Kinabatangan, Sabah's Danum Valley and Mount Kinabalu National Park. 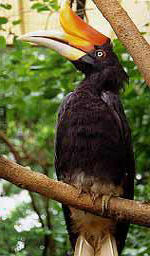 Many species of hornbill (8 - 9) are found in Malaysia. Some of them endangered or only present in small, isolated populations. The iban hunted hornbills for the tail feathers, which they use to decorate ceremonial headdresses. A single group of dancers may use as many as 400 feathers on their headdresses, for which they would have to kill about 40 birds. But that's over now. The hornbills nestle in a hole high up in an old tree. It's the largest birds in the forest. During mating season, male hornbills reportedly use their casqued bills for spectacular head-on collisions in mid-air. A month or more before mating, the male hornbill begins courting the female by bringing her food. When ready to lay her eggs, the female will enter a nest hole high in the hollow tree. The pair will then spend two or three days plastering up the hole with the female's clay-like droppings � she on the inside, he on the outside � using the sides of their bills as trowels. 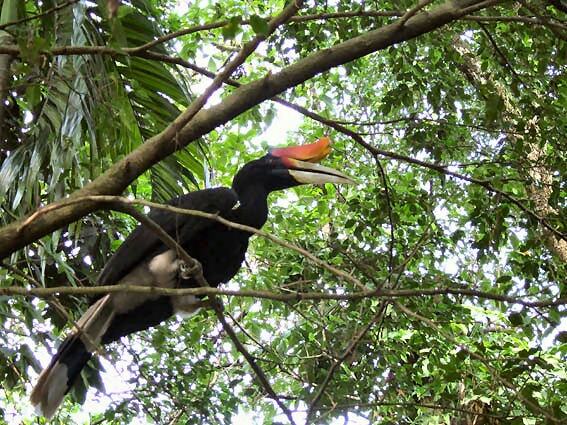 Hornbills appear to pair for life. The are banding together to defend a territory against other members of their species. This helps to ensure adequate food supply as well as "exclusive rights" to nesting sites. Hornbills are critical to the dispersal of figs because they eat the entire fruit, including the seed, and then fly long distances, dispersing the seeds widely. Throughout the world figs grow most abundantly in Sarawak, and about 80 varieties of the figs can be observed there. The best way to see a hornbill is to locate a large wild fig plant and to hide nearby, for figs seem to be the favourite food of the hornbill.